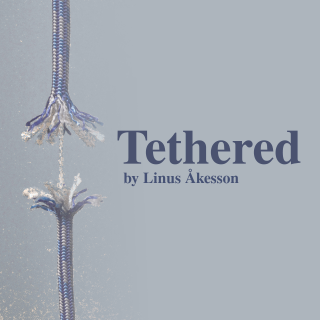 Tethered is my debut work of interactive fiction. It was entered into the prestigious IFComp (Interactive Fiction Competition) of 2018, and ended up on 23rd place out of 77 games. You can play Tethered online, in your web browser. At certain points, including at the very beginning, you are expected to press any key to continue. When you see a prompt (>), you are supposed to type an action, such as “examine me” or “go north”. If you are unfamiliar with parser-games in general, you may want to start with “help”. Note that, by default, a full transcript of your play session will be logged on the server. These transcripts are extremely helpful to me, as I strive to improve my skills as an IF writer. Should you prefer to play without being logged, please use this link instead, or download the game and play locally. Please play the latest version. You will need an interpreter that is capable of reading zblorb files, such as Gargoyle or Frotz. After the Comp, authors traditionally reflect on their work in a post-mortem article. Here is mine. Please play the game before reading the post-mortem, as there are spoilers. Here is the IFDB page for Tethered. Interesting game Linus, I'd never played a game like that, interesting! A parser game! The story was also compelling. Great job. Great game! I enjoyed the trip. It became frustrating at some point and I relied on the hints rather too frequently. Especially where I had to push the boulders around, I was too tired to remember the navigations that I just pushed the boulder around until something clicks. * get Charles to be naked. * I did try "panic" at one point but it didn't seem to do anything. Dialog looks interesting, any chance that the source for Tethered will be released? This would be incredibly helpful. Whilst the manual and standard rules help having a fully worked example would be a bonus. What is Fizmo doing that Tethered doesn’t like? It seems to be able to run other games in zblorb format, such as Savoire-Faire.